MOHD MAJID MALIK ,BHADERWAH,Nov 19— BJP senior leader and Union Home Minister Rajnath Singh today said Article 370 of the Constitution giving special status to the state had caused it “immense loss”and there is immediate need of discussion on the topic .“The laws made by the Centre are not implemented in the state due to the Article 370. 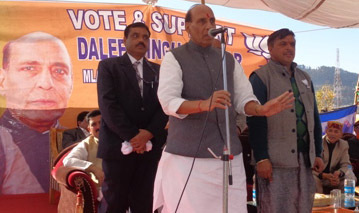 The panchayats could not get power as 73rd amendment to Constitution did not come into force in Jammu and Kashmir thereby stopping the development at gross-roots level” Rajnath said.Addressing an election rally of campaigning for Bhaderwah seat, the BJP leader said the party would welcome the special status granted to the state if any political organisation could list the advantages of the Article and said only few families in Jammu and Kashmir get its benefit .Rajnath said his party was against any sort of “appeasement” and was rather focused on development of people.“We are determined to get development to the doorsteps of poor as in only six months our government bring down the inflation in the country and in one and half year we completely controlled the rising prices ,” he said.The senior leader, however, said his party was concerned about the progress of J&K and if Article 370 helped the state grow, the BJP would accept it wholeheartedly and said Article 370 is a national issue .“We want Jammu and Kashmir to progress on a par with other states. If J&K grows because of Article 370 then we have no objection to keeping it,” Rajnath said.The BJP’s candidate from Bhaderwah constituency is facing a direct challenge from Congress leader and sitting MLA Mohd Sharief Naiz and PDP candidate Sheikh Mehboob Iqbal in the assembly segment, which is scheduled to go to the polls on Nov 25.Rajnath also raised the issue of killing of sarpanches in the Kashmir . He alleged that the government had failed to provide security to the elected panchayat representatives.The BJP senior leader also made an attempt to woo the POK refugees living in the state by lashing out at the National Conference and the Congress for their “deplorable condition”.“The NC and the Congress have failed to solve the problems of migrants and refugees for the last four decades and said like other parts of the nation people want change in Jammu and Kashmir and i assured u to work for all sections of the society which were ignored by decades ,” Rajnath alleged.“Have you heard of any country where people are even struggling for basic rights for more than 40 years?” Rajnath asked.“The BJP will work towards the resolution of refugees’ problems and give them the right to vote by bringing a rehabilitation policy for them if BJP formed its government in the state ,” he added.Pointing out at the “soft approach” of the previous Congress-led UPA towards firing on borders , the senior leader said: “We want good relations with our neighboring countries Pakistan and China , but not at the stake of our sovereignty and integrity.”“The previous Congress-led UPA was responsible for the barbaric killing of Indian Indian people on the Line of Control but when we take over the government our govt gave strong reply to Pakistan on borders ,” he said.Comparing the Atal Bihari Vajpayee-led NDA government with the UPA, Rajnath said: “The Congress has not given anything to the country. On the contrary, one has to see the approach and vision adopted by the former Prime Minister Atal Bihari Vajpayee, who created hope among the people of J&K in his tenure and bring inflation down but Congress government failed to do so .”Rajnath urged people to vote for the BJP candidate and strengthen Modi’s hands. Union Home minister Rajnath Singh said now whole world is giving red carpet welcome to PM Narinder Singh Modi whom once upon a time America denied of Visa , he said adding that Congress had vanished from whole India only due to its misdeeds . He also threw light on the relief and rehabilitation work done by Central govt for the flood effected people of Jammu and Kashmir and urged people to cast their vote to BJP candidate and we will not breach your trust and said different surveys are indicating that there is possibility of BJP government in Jarkhand and Jammu and Kashmir . However before the address of Rajnath Singh BJP candidate Daleep Singh Parihar seek the attention of senior leader towrds the various burning issues of people of Bhaderwah which he assured to resolve .Satish Chander Kotwal , Adv Manjeet Razdan , Koshal Kotwal , Raj Singh Kotwal , Munish Kotwal and others were also present on the stage .